The MustWin Performance Support Tool shifts the focus from proposal data management and assembly, to creating proposals with meaning. Discover what it will take to win. Instruct people regarding what information to gather. Discuss how to get it. Implement Readiness Reviews. Design the offering based on what it will take to win. Instruct SMEs regarding the anticipated scope and customer requirements. Discuss platforms and approaches. Self-assess whether the offering design will meet the needs of the proposal. Assessment by reviewers of the offering design's readiness for use in the Proposal Content Plan. Prepare a plan for the proposal content that defines quality and integrates everything related to what it will take to win. This is where the MWPST excels. But you still need input from the first two goals. So guiding people to bring what you need helps you excel. Write to fulfill the instructions and quality criteria in the Proposal Content Plan. Instead of a blank page, the MWPST puts the plan next to Microsoft Word as people write, enabling self-assessment, progress tracking, and discussion. Validate that the draft reflects the quality criteria. 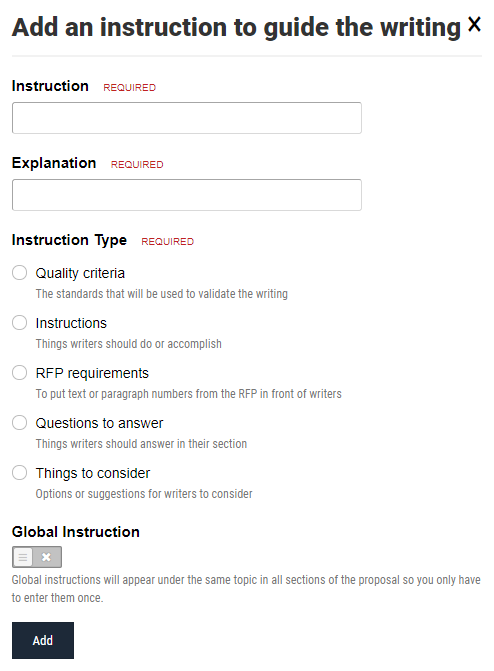 The MWPST is the only tool I know of that enables proposal writers and quality reviewers to work from the same quality criteria and make it checklist simple. Produce a final copy without any defects for an on-time submission. By the time you get here, the planning is complete and you are doing final production in Microsoft Word or some other word processing or publishing package. But you can use the MWPST to provide instructions and specifications, and to perform the final quality control checks before submission. The trick to implementing a proposal process that optimizes the flow of information is to put information in a form that best suits the next step in the process, instead of just storing it. Documents (Word, PowerPoint, Excel, and the like) turn out to be poor formats for acting as an information repository. Documents require putting a lot of effort into things that get orphaned. This is why we prefer articulating things as instructions and quality criteria. Instead of simply pointing proposal writers at a bunch of files with data buried in them so they can spend their time finding and figuring out what to do with them instead of writing, the MustWin Performance Support Tool makes it easy to just tell them. It puts everything in a form that is useful to proposal writers. It shifts the focus from proposal data management and assembly to creating proposals with meaning.